Suitable for metal utensils (except knives and whisks). 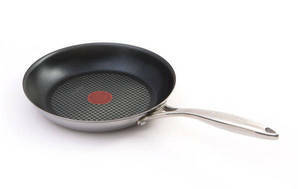 Has thermospot to indicate when pan is heated. Stainless-steel handle may become dangerously hot and has no non-slip grip. 19 Jul 2018, Richard M.
Returned to Briscoes after a few months replaced. Second time coating came peeling off, asked for a refund. 29 Jul 2017, David F.
When you first use it it's fantastic, good weight, non-stick, but doesn't last.